Abstract. Inherited hypokalemic renal tubulopathies are differentiated into at least three clinical subtypes: (1) the Gitelman variant of Bartter syndrome (GS); (2) hyperprostaglandin E syndrome, the antenatal variant of Bartter syndrome (HPS/aBS); and (3) the classic Bartter syndrome (cBS). Hypokalemic metabolic alkalosis and renal salt wasting are the common characteristics of all three subtypes. Hypocalciuria and hypomagnesemia are specific clinical features of Gitelman syndrome, while HPS/aBS is a life-threatening disorder of the newborn with polyhydramnios, premature delivery, hyposthenuria, and nephrocalcinosis. The Gitelman variant is uniformly caused by mutations in the gene for the thiazide-sensitive NaCl-cotransporter NCCT (SLC12A3) of the distal tubule, while HPS/aBS is caused by mutations in the gene for either the furosemide-sensitive NaK-2Cl-cotransporter NKCC2 (SLC12A1) or the inwardly rectifying potassium channel ROMK (KCNJ1). Recently, mutations in a basolateral chloride channel CLC-Kb (CLCNKB) have been described in a subset of patients with a Bartter-like phenotype typically lacking nephrocalcinosis. In this study, the screening for CLCNKB mutations showed 20 different mutations in the affected children from 30 families. The clinical characterization revealed a highly variable phenotype ranging from episodes of severe volume depletion and hypokalemia during the neonatal period to almost asymptomatic patients diagnosed during adolescence. This study adds 16 novel mutations to the nine already described, providing further evidence that mutations in the gene for the basolateral chloride channel CLC-Kb are the molecular basis of classic Bartter syndrome. Interestingly, the phenotype elicited by CLCNKB mutations occasionally includes HPS/aBS, as well as a Gitelman-like phenotype.
. In Gitelman syndrome (GS), the hypocalciuric-hypomagnesemic variant (3), patients are often asymptomatic with the exception of transient muscular weakness, carpopedal spasms, tetanic episodes, and abdominal pain. Therefore, diagnosis is made as a rule after the age of 6 yr. In contrast to the other variants, there is marked hypocalciuria and hypomagnesemia.
. Hyperprostaglandin E syndrome (HPS), also known as antenatal Bartter syndrome (aBS) (1,2,4,5), is the most severe form and leads to polyhydramnios and premature birth due to excessive polyuria in utero. Often there is a life-threatening clinical course in the perinatal period with severe salt and water loss, hypokalemic alkalosis, and systemic manifestations such as fever, vomiting, diarrhea, and failure to thrive. Marked hypercalciuria and the development of nephrocalcinosis ensue often within several weeks. Generalized symptoms have been attributed to enhanced systemic prostaglandin formation, and treatment with indomethacin, an inhibitor of prostaglandin synthesis, is the most effective therapeutic option (5).
. Classic Bartter syndrome (cBS) presents with sequelae of pronounced hypokalemia and marked salt loss resulting in muscle weakness and volume contraction during the first years of life. Nephrocalcinosis is an uncommon finding, and investigation of renal concentrating ability is impaired to a lesser extent than in HPS/aBS (2).
. Mutations in the furosemide-sensitive luminal Na-K-2Cl cotransporter (SLC12A1), which is expressed in the thick ascending limb of Henle's loop, cause the genetic variant of BS type 1 (MIM 600839) and lead to the clinical phenotype of HPS/aBS (9,10,11). This is in keeping with the observation that there is an impaired response to furosemide in HPS/aBS patients and that the clinical phenotype of HPS/aBS mimics the sequelae of chronic furosemide treatment (12).
. Mutations in the gene for the inwardly rectifying potassium channel ROMK (KCNJ1) cause the genetic variant of BS type 2 (MIM 600359) and lead to the clinical phenotype of HPS/aBS (13,14,15). ROMK ensures functioning of the Na-K-2Cl cotransporter by recycling potassium back to the renal tubular lumen.
. Mutations in the gene for the basolateral chloride channel CLC-Kb (CLCNKB) cause the genetic variant of BS type 3 (MIM 602023), which is defined by a distinct subset of patients in whom nephrocalcinosis is absent. Diagnosis in these patients is usually made during infancy or childhood (16). No prenatal history of polyhydramnios or prematurity is reported. Except for the finding that defects in SLC12A3 in all cases reported uniformly result in GS, very little is currently known about genotype-phenotype correlations within the other variants of BS. For mutations in CLCNKB (BS type 3), there is a report from the initial publication that these genetic defects might cause a milder form of BS, as seen in cBS (16). Therefore, we set out to study the question of whether mutations in CLCNKB in fact are the underlying cause of cBS. Initially, we screened for CLCNKB mutations in a cohort of 50 patients from 43 families, in whom we were previously unable to identify any mutation in the genes for NCCT, NKCC2, and ROMK. Clinically, the cohort consisted of patients with GS (n = 5), HPS/aBS (n = 7), and cBS (n = 38). In 36 patients from 30 families, 20 different mutations in CLCNKB were detected, 16 of which are novel. These patients were carefully reanalyzed clinically. We found that these patients presented with a highly variable phenotype, ranging from a severe perinatal course to patients who were almost symptom-free and were diagnosed only by accidental detection of hypokalemia with the majority fulfilling the criteria of cBS. A novel nonhomologous recombination event in the CLCNKB gene was detected. We analyzed by mutational analysis 50 patients from 43 families diagnosed as having either GS (n = 5), HPS/aBS (n = 7), or cBS (n = 38), in whom no linkage to or mutations in SLC12A3, SLC12A1, and KCNJ1 was detected in previous studies (7,10,11,14,15,17). Diagnosis of GS and HPS/aBS was made following the criteria of Bettinelli et al. (18) and Seyberth et al. (4,5), respectively. Patients were considered as having cBS when they presented with hypokalemic alkalosis, renal salt wasting without antenatal manifestation, and no major disturbance of serum calcium or magnesium. This study was approved by the local ethics committee, and informed consent was obtained from the patients and/or their parents. Genomic DNA of all affected individuals and available family members was extracted from whole blood by standard methods (19) or after Epstein-Barr virus transformation of peripheral blood lymphocytes (20). Haplotype analysis was performed as described previously (14), using the following markers, which were linked to the CLCNKA/CLCNKB loci: D1S2826, D1S2672, D1S2644, D1S507, and D1S436 (21). Microsatellite polymorphisms were amplified as described previously (14), and amplified products were separated on 0.5× Trisborate-ethylenediaminetetra-acetic acid, 6% polyacrylamide gels run under denaturing conditions (22). The gels were analyzed using Genescan 672 software, version 1.2 (Applied Biosystems), the Pharmacia Fragment Manager (Amersham Pharmacia), or autoradiography. Haplotypes were constructed from the genotype data. The most likely haplotypes were inferred by minimizing the number of crossover events in each sibship. Because a relatively high percentage of patients that bear a homozygous deletion in the CLCNKB has been reported (16), we first screened for such deletions by PCR. The patients without homozygous deletions underwent mutational analysis by single-strand conformation analysis (SSCA). CLCNKB-specific exonic primers that by long-range PCR amplify exons 1 to 2 (fragment A), exons 6 to 9 (fragment B), and exons 17 to 19 (fragment C) were used to detect large homozygous deletions of the CLCNKB gene (16). Primers specific for an unrelated gene were included in each reaction as a positive control. Suspected deletions were verified by individual amplification of all exons separately. For PCR details, see below. The CLCNKB gene was screened for mobility shifts by SSCA (23). Primers that amplify the 19 exons of CLCNKB together with their splice sites have been described previously (16). It must be noted that because of the high sequence similarities between CLCNKB and CLCNKA, only primer pairs directed to exons 2, 4, 9, 14, 16, 17, and 18 specifically amplify CLCNKB sequence without interference by products from CLCNKA. Therefore, we generated CLCNKB-specific exon/intron products by long-range PCR, which was specific for CLCNKB sequence (see above). These large, sequence-specific CLCNKB fragments were generated by using primer pairs ex2for/ex4rev, ex4for/ex9rev, and ex9for/ex14rev, respectively. PCR templates for the remaining part of CLCNKB were obtained as follows: Using the nonspecific primers ex15for and ex16rev, we obtained two fragments of 0.5 and 1.5 kb, each being specific for CLCNKA or CLCNKB, respectively. After gel electrophoresis, CLCNKB fragments were dissolved in deionized water and used as templates for amplification of the individual CLCNKB exons. Specificity of all amplification products was verified by direct sequencing. Primers specific for CLCNKB exon 1 were newly designed for this study: ex1F (5′ -ACCGCGGTCCCTCCCTCTAT-3′) and ex1R (5′ -GATGTCCTGAGTGGTCCTCCAG-3′). PCR was performed in a 20-μl volume containing 50 ng of genomic DNA, 1.5 mM MgCl2, 5 mM Tris (pH 8.3), 50 mM KCl, 10 pmol of each primer, and 1.0 U of Taq polymerase. After an initial step at 94°C for 5 min, PCR was conducted for 30 cycles with denaturation at 94°C for 45 s, annealing at 55 to 65°C for 30 s, and extension at 72°C for 45 s. The reaction was completed with a final elongation step at 72°C for 10 min. Amplified products were separated using the CleanGel DNA Analysis kit (Pharmacia Biotech) with the Multiphor II electrophoresis system (Pharmacia Biotech) at 18 W constant power at 15°C for 1 h, or alternatively using the Multigel-Long unit (Biometra, Göttingen, Germany) at 100 V constant voltage at 4 and 14°C for 14 h with and without 10% glycerol. The band patterns were visualized by the silver staining method. Direct sequencing was performed after reamplification of the remaining PCR products, using 5′ -cy5-labeled primers on an ALF express sequencing system (Pharmacia Biotech) according to the protocols provided by the manufacturer. Alternatively, an automated ABI 373A sequencer was used with fluorescence-labeled dye terminators (Applied Biosystems, Weiterstadt, Germany). DNA sequences were confirmed by sequencing both strands from the patient, the respective parents, and a healthy control subject. Mutations were discerned from innocuous polymorphisms by demonstration of their absence in more than 50 control chromosomes. Dinucleotide markers linked to the CLCNKB locus on chromosome 1 were haplotyped in 12 kindreds (1 GS, 3 HPS/aBS, 8 cBS). Haplotype analysis was compatible with linkage between BS and CLCNKB in the following 8 out of 12 families examined: families Marb7047/7050, Marb7182/7183, Marb7028, Marb7117/1196, Marb7096/7245, Marb7377, Marb7132, and Marb7194 (Figure 1). 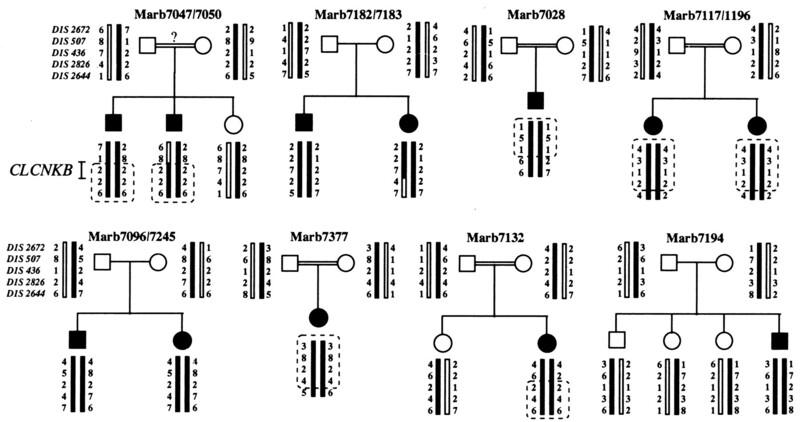 All eight families with the exception of Marb7028 had the clinical diagnosis cBS, whereas Marb7028 was considered as having GS. In the remaining four families (3 HPS/aBS, 1 cBS), haplotype data were not compatible with linkage to the CLCNKB locus; meanwhile, linkage to 1p31 has been found in the three HPS/aBS kindreds (N. Jeck, unpublished observation). Given the haplotype data, we initiated a search for mutations in CLCNKB only in those kindreds in which linkage to CLCNKB has been demonstrated, as well as in 31 additional families with patients exhibiting symptoms of either GS (n = 4), cBS (n = 25), or HPS/aBS (n = 4). Pedigrees and haplotypes of Bartter syndrome families with linkage to the CLCNKB locus on chromosome 1p CLCNKB interval. The CLCNKB gene is localized between markers D1S507 and D1S2826. Regions of homozygosity are framed with a dotted line. A total of 45 patients from 39 families with Bartter-like diseases were examined for homozygous deletions or SSCA band shifts in CLCNKB. All index cases had a history of hypokalemic alkalosis and hyperreninemic hyperaldosteronism without arterial hypertension. In eight families, patients were the offspring of a known consanguineous union. Twenty different alterations of CLCNKB sequence were found in 36 affected individuals from 30 families. Specifically, a total homozygous deletion of CLCNKB was found in nine families, there was one unequal crossing over, two different small deletions, 10 different missense mutations, three different frameshift mutations, and four different splice-site mutations (Tables 1 and 2). In 20 families, both potential loss-of-function mutations in CLCNKB were detected (Table 1), whereas in 10 families only one mutation was found (Table 2), which is most likely due to the limitations of SSCA. Absence of the three exonic CLCNKB long-range PCR products A, B, and C (see Materials and Methods), indicating a homozygous deletion of CLCNKB, was detected in affected individuals from nine families (Tables 1 and 2). Subsequently, these findings were confirmed by PCR on the individual exons. When primers specific for CLCNKB were used, no PCR product was obtained (Figure 2A). If promiscuous primers were used, only the band for CLCNKA was obtained. In one additional kindred (TrouNN9), a homozygous loss of 78 bp in exon 6 of CLCNKB was demonstrated. (A) Genomic organization of CLCNKA/B. Detection of homozygous rearrangements by PCR. Exons are indicated as vertical traits, and arrows indicate primer positions. +, presence of fragment by PCR; -, absence of fragment by PCR; WT, wild type. (B) Schematic model of the nonhomologous recombination between CLCNKA and CLCNKB in patient Marb7188. In one kindred (Marb 7188), reciprocal loss of CLCNKA and CLCNKB was detected. In this kindred, exons 13 to 19 of CLCNKA and exons 1 to 12 of CLCNKB are lacking. Given the small physical distance between both genes and their topology, probably an unequal crossover event led to this rearrangement (Figure 2B). Sequence analysis of a fragment obtained by PCR between a promiscuous forward primer (ex 12for) in exon 12 and a reverse primer specific for CLCNKB (ex 14rev) in exon 14 identified the fusion point to a region of 40 bp between CLCNKA and CLCNKB in the intronic region between exons 12 and 13 without affecting the respective donor and acceptor splice sites. Therefore, this rearrangement leads to a chimera of both genes that might give rise to a fusion protein, which does not have the same functional characteristics and/or tissue distribution as CLC-Kb (Figure 2B). Cosegregation analysis revealed that this rearrangement in the affected daughter is present in the hemizygous state because it was detected heterozygously only in the patient's mother, whereas sequencing in the father yielded the normal sequence. The most likely explanation is that the father is heterozygous for a deletion of CLCNKB. Besides the homozygous deletions encompassing at least parts of CLCNKB, several nonsense and missense mutations cosegregating with the affected phenotype were identified (Tables 1 and 2, Figure 3). Two 4-bp insertions at positions S518 and P630 (Figure 4, maternal allele) were identified. Both mutations led to a truncated protein lacking the C-terminal end with putative transmembrane domain D13. A third frameshift mutation affects P463, leading to a premature stop codon within transmembrane domain D12. Four missense mutations located within transmembrane domains were detected. In one family, the two affected children (Marb7183 and Marb7182) turned out to be heterozygotes for L139P (Figure 4, paternal allele), which is a highly conserved residue between species (human, rabbit, rat, Torpedo californica, Caenorhabditis elegans) and within the chloride channel gene family (CLC1, CLC2, CLC3, CLC5), located in transmembrane domain D3. One heterozygous missense mutation concerns R438, which is substituted by a histidine, affecting a conserved amino acid located in transmembrane domain D10. Simon et al. (16) reported the substitution of the same codon by a lysine residue in one patient. Two additional mutations located in transmembrane domains D7 and D8 concern serine residues (S297R and S337F), which are conserved between humans, rabbit, and rat only. Two affected children from apparently unrelated families with a different ethnic origin (family Marb7377 from Turkey and family NeckCB.6 from Italy) showed the same mutation, substituting leucine for proline at codon 124. This residue, located between transmembrane domains D2 and D3, is highly conserved. This mutation already has been described by Simon et al. (16) in two unrelated but consanguineous Turkish families. This mutation in the sequencing appears hemizygous. This finding is supported by the fact that the parents are not related, and it was detected in the heterozygous state only in the father. The mother, therefore, most likely contributes a CLCNKB deletion. We also detected mutations of obligatory splice-acceptor sites: one at position G289 (nt901-1) at the 3′ end of intron 9 in two patients (Nijm7 and Marb7202), one at position E261 (nt816-2) in patient Nijm4, and a heterozygous splice-donor mutation in patient Marb7288 at position A77 (nt264-2) at the 5′ end of intron 2. These mutations can be expected to result in abnormal splicing or exon skipping. None of these mutations were detected in over 50 control chromosomes. There are five additional missense mutations (A77T, H357Q, R538P, K560M, S573Y) in regions of limited conservation that have not been detected in controls. The pathophysiologic effect of these sequence exchanges will require functional analysis. Model of human CLC-Kb transporter topology and positions of amino acid exchanges due to mutations in the CLCNKB gene as identified in Bartter syndrome patients. Putative transmembranous α-helical domains are numbered (1 to 13). Amino acids are represented by gray or white circles with amino acid numbering given at intervals in white circles. Amino acid exchanges are shown using the standard notation. 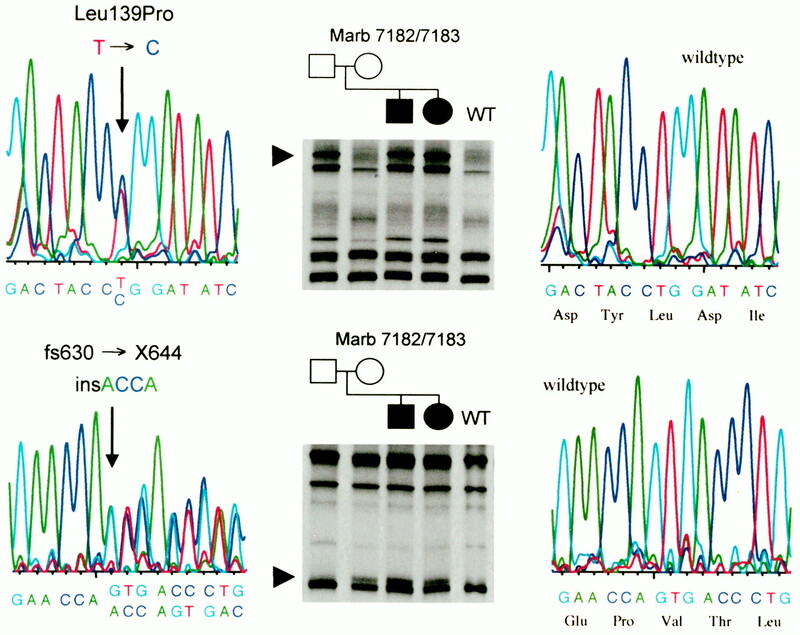 Example of single-strand conformation analysis and direct sequencing in family Marb7182/7183. (Top) Paternal allele: T-C exchange leading to L139P. (Bottom) Maternal allele: insACCA resulting in a frameshift at aa630 and a premature stop codon at aa644. WT, wild type; fs, frameshift; X, stop. Aside from the potential loss-of-function mutations described, a number of nucleotide exchanges were detected, which probably represent innocuous polymorphisms of CLCNKB. Some were silent mutations without an amino acid exchange. Others led to an amino acid exchange, but were detected also in healthy control subjects. Those amino acid exchanges might have a potential functional role as single nucleotide polymorphisms, under the hypothesis that mutations in genes for transporters for renal sodium absorption might be candidate genes for essential hypertension (24). To our knowledge, a valid heterologous expression system for CLC-Kb is still missing, and therefore at the moment no definitive statement on the functional consequences can be made. Mutations that led to an amino acid exchange—but probably represent innocuous polymorphisms because they did not cosegregate with the disease phenotype in the families and/or were also present in healthy individuals—implicated the following amino acids: L27R (CTC>CGC), I419V (ATC>GTC), T481S (ACC>TCC), T562M (ACG>ATG), A577T (GCC>ACC), and E578K (GAG>AAG). CLCNKB mutations were detected in 36 patients from 30 families, eight of whom were known to be consanguineous. The clinical diagnosis of cBS was made in 33 patients of 27 families. Two patients were considered as having HPS/aBS and one patient as having GS. The clinical data are summarized in Tables 1 and 2. All patients had episodes of hypokalemic alkalosis, and almost all had evidence of renal salt wasting. Hyperreninemic hyperaldosteronism and hyperprostaglandinuria were present in all cases studied. Diagnosis of BS was made prenatally (3 of 34) or in the first year of life (22 of 34) often after an episode of severe volume depletion and/or severe hypokalemia. All other patients were diagnosed during early childhood with one exception. In patient Marb7202, diagnosis was made at the age of 11 yr. Patients in whom both potential loss-of-function mutations were identified were analyzed for the clinical features of HPS/aBS, i.e., polyhydramnios, iso/hyposthenuria, and hypercalciuria with nephrocalcinosis. We obtained the following results (Table 1). Eight of 25 patients had a history of polyhydramnios. Iso/hyposthenuria was detected in six of 22 patients. Persistent hypercalciuria was detected in five of 25 cases, while two additional patients showed transient hypercalciuria but their calcium excretion is normal at present. Four of 25 patients had nephrocalcinosis, while two additional patients showed renal calcifications during infancy, which resolved later in life. The cardinal clinical signs of GS, e.g., hypocalciuria and hypomagnesemia, were evident in two of 25 and nine of 23 patients, respectively. One patient (Marb7028, Table 1) was repeatedly found to have both hypocalciuria and hypomagnesemia, and thus met the clinical criteria for GS. However, the patient also manifests clinical findings unusual for GS, i.e., early presentation at the age of 9 mo, with failure to thrive and hypokalemia. Indomethacin therapy was successful in correcting the patient's growth failure but not the persistent hypomagnesemia and hypocalciuria. Because the same CLCNKB mutation is present in a heterozygous state in both parents, we suspected consanguinity in this family. Haplotype analysis of polymorphic markers revealed homozygosity for the CLCNKB locus but not for SLC12A3. In addition, this patient did not show any band shift in an SSCA in any exon of SLC12A3. These data indicate that the GS-like phenotype in this child does not involve SLC12A3, but rather that the homozygous mutation in CLCNKB is pathogenic. The finding that iso/hyposthenuria was more frequent in the group of patients in whom only one potential loss-of-function mutation was identified most likely represents an ascertainment bias (Table 2). This study reports the identification of novel CLCNKB mutations in 30 families with Bartter-like syndromes, most of them fulfilling the clinical criteria of classic BS. In addition, the phenotypic spectrum and its overlap with the other variants of BS has been clinically characterized. As in a previous study, there was a high rate of deletions encompassing the whole CLCNKB gene (16). The most simple explanation for this observation would be the action of a founder effect. However, this seems unlikely for two reasons: (1) the widely varying ethnic origin of the patients reported in this study (Tables 1 and 2) as well as in the patients reported by Simon et al. (16) contradict this hypothesis; (2) a common haplotype did not emerge significantly from haplotype analysis of the flanking microsatellite markers in the outbred population (data not shown). A common ancestor cannot definitely be ruled out, however, because the physical distance between the two flanking genetic markers is unknown. It is more likely that these deletions occurred independently. The close vicinity of the almost identical CLCNKA and CLCNKB genes predispose to a high rate of rearrangements, for example, by unequal crossing over as demonstrated in family Marb7188. There are other examples of human chromosomal rearrangements in a context of highly homologous or repetitive sequences (25). In a previous study, Simon et al. (16) demonstrated that in one kindred a deletion arose by unequal crossing over between CLCNKA and CLCNKB in intron 2. The authors concluded that the deletions that led to loss of the entire CLCNKB gene resulted from nonhomologous recombination between similar regions downstream from the 3′ end of each gene. In this study, we report a novel CLCNKA/CLCNKB chimera, and by sequence analysis located the fusion point within intron 12. Therefore, these rearrangements clearly occurred independently, lending further support to the notion that the other deletions described occur in a similar way through fusion beyond the 3′ ends of both genes. In the absence of a solid heterologous expression system, we did not perform additional studies and therefore we cannot state whether this chimeric gene results in a chimeric protein or what its function would be if it does. In addition to the deletions, we report 17 different potential loss-of-function mutations, 16 of which are novel. There are 10 different nonconservative amino acid changes, three different frameshift mutations leading to preterminal truncation of the protein, and four different splice-site mutations. Only one mutation (L124P) has been reported previously (16). The remaining mutations define novel molecular variants that cosegregate with the disease phenotype. These mutations can be expected to modify or disrupt the protein and thus alter its function. It is theoretically possible that in the group of patients in whom only one potential loss-of-function mutation was identified (Table 2), the phenotype is based on a digenic mechanism, with a combination of a heterozygous defect in one of the other genes for Bartter-like syndromes. This is very unlikely, however, because SSCA for SLC12A1, SLC12A3, and KCNJ1 yielded no band shifts in these patients. In one of their original reports, Bartter and colleagues speculated on a defective chloride reabsoption in the thick ascending limb of Henle's loop (26). In addition, on a physiologic basis there is evidence that a major part of chloride reabsorption takes place in the thick ascending limb of Henle's loop (reviewed in reference (27). 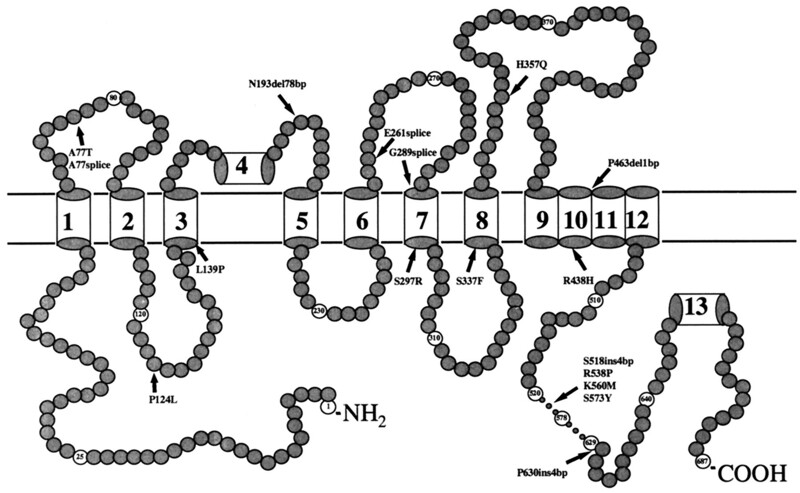 Recent identification of loss-of-function mutations in the genes encoding the bumetanide-sensitive Na-K-2Cl cotransporter (NKCC2), the apical, ATP-regulated potassium channel (ROMK), and the kidney-specific chloride channel (CLC-Kb) support this pathophysiologic model (6,9,10,13,14). Defects in any of these proteins would impair net NaCl reabsorption in the thick ascending limb, and thereby increase NaCl delivery to more distal nephron segments, with consequent salt wasting, volume contraction, and stimulation of the renin-angiotensin-aldosterone axis, leading to hypokalemic metabolic alkalosis. Moreover, impaired NaCl transport in the thick ascending limb is associated with reduction in the lumen-positive transmembrane potential, which normally drives the paracellular reabsorption of calcium and magnesium (27), causing increased urinary loss. Indeed, hypercalciuria is a common feature of the HPS/aBS variants and often leads to nephrocalcinosis. Studies by Simon et al., as well as by our International Collaborative Study Group, have demonstrated that patients with loss-of-function mutations in the genes encoding NKCC2 or ROMK have a similar phenotype characterized by polyhydramnios, premature delivery, isosthenuria, and nephrocalcinosis (9,10,13,14). In contrast, the patient cohort described in this report manifests a broad spectrum of clinical features that range from the HPS/aBS phenotype with polyhydramnios, isosthenuria, and hypercalciuria over the classic BS phenotype with less impaired concentrating ability and normal urinary calcium excretion to a GS-like phenotype with hypocalciuria and hypomagnesemia. Interestingly, only four patients had evidence of nephrocalcinosis. When stratified according to clinical features, no correlation was identified between particular phenotypes, including nephrocalcinosis, and specific CLCNKB mutations or types of mutations, i.e., large genomic deletions or mutations causing protein truncation, splicing abnormalities, or amino acid substitutions. Several physiologic factors may contribute to this wide range of clinical phenotypes. The NKCC2 and ROMK proteins are expressed on the apical membrane of the thick ascending limb, and their physiologic coupling accounts for at least 50% of NaCl transport in this nephron segment. In comparison, chloride efflux across the basolateral membrane of the thick ascending limb can occur via the CLC-Kb channel, but also via a potassium chloride (KCl) cotransporter and perhaps other chloride channels such as by cystic fibrosis transmembrane regulator and CLC-5 (28,29). These alternative routes for basolateral chloride efflux may compensate to variable extents for defects in CLC-Kb function. For reasons that have yet to be elucidated, it seems that in some patients, CLC-Kb defects cause a marked impairment in transepithelial NaCl transport with consequent severe volume contraction and secondary potassium secretion. In other patients, the basolateral compensatory transport processes attenuate the NaCl transport defect and cause a milder degree of volume contraction, with a resulting minor phenotype. We propose that the magnitude of impairment of NaCl transport in the thick ascending limb and the associated reduction in the lumen-positive potential may directly influence the extent of urinary calcium and magnesium loss. Based on the data presented, we propose that CLCNKB mutations most commonly cause the classic Bartter phenotype. However, in a minority of patients, mutations in CLCNKB can also cause phenotypes that overlap with either HPS/aBS or GS. Therefore, the full phenotypic spectrum of the Bartter-like syndromes can result from mutations in CLCNKB. Our data do not provide any evidence that allelic differences in CLCNKB might explain this wide phenotypic variability. However, before a final conclusion can be made, additional studies that include heterologous expression systems need to be performed. This study also raises the question of whether the nomenclature of the hereditary hypokalemic salt-losing tubulopathies should be based on the clinical presentation or, alternatively, on the genotype as proposed by others. We would prefer the clinical one for the following reasons. The diagnosis of the patient has to be made as soon as possible, which usually can be done through an easy set of clinical investigations, whereas genotyping still is a time-consuming procedure. Once the genotype is established, it appears to be more helpful to include it in the clinical diagnosis, i.e., classic Bartter syndrome (CLCNKB) rather than Bartter type III. As demonstrated in this study, there is no direct genotype-phenotype correlation, and therefore Bartter type III would not contain the appropriate information regarding the patient's disease. Moreover, there is accumulating evidence that there is at least as much overlap between cBS and GS as between cBS and HPS/aBS, and using the term Bartter types I, II, and III on one hand and GS on the other may be misleading, at least for clinicians outside the field of nephrology. Drs. Konrad, Jeck, and Seyberth were supported by the Deutsche Forschungsgemeinschaft (Se263/15-1). Drs. Hildebrandt and Vollmer were supported by the Zentrum Klinische Forschung (A1) (Freiburg, Germany). Drs. van den Heuvel, Lemmink, and Knoers were supported by the Dutch Kidney Foundation (C96. 1540). Dr. Guay-Woodford was supported by the Alabama Kidney Foundation. The International Collaborative Study Group for Bartter-Like Diseases is supported by the “Concerted Action for the Identification of the Gene Defects in Bartter Syndrome and Gitelman Syndrome,” funded by the European Economic Community within BIOMED II program PL950260. This study was performed in cooperation with the International Study of Genetic Renal Disease. The authors are indebted to the participating patients and their families for their cooperation. We thank the following physicians for the contribution of patient material and clinical information: B. Tönshoff, J. Meyburg (Heidelberg), M. Kemper (Hamburg), T. Welch (Cincinnati), V. Siller (Stolberg), N. Jorch (Bielefeld), W. Marg (Bremen), M. Morlot (Hannover), R. Zass (Münster), E. Abel (Greifswald), W. Proesmans (Leuven), L. Monnens, F. Huysmans, T. Smilde (Nijmegen), F. Flinter, L. Solomon (London), J. Rizzoni (Milan), P. Niaudet, Ch. Loirat (Paris), P. Cochat, L. Dubourg (Lyon). Dr. Martin Konrad and Dr. Martin Vollmer contributed equally to this work. Dr. Daniel G. Bichet served as Guest Editor and supervised the review and final disposition of this manuscript.